One of the most visited natural landmarks in the region, Ichetucknee Springs State Park is a must-see. Ichetucknee is a spring-fed, crystal-clear river of approximately six miles in length. For a small entrance fee you can get active on the Ichetucknee with scuba diving, snorkeling, cave exploration, swimming, paddle-boarding, canoeing and kayaking. Or, for the ultimate relaxation experience, visitors can choose to let the river's flow do all the work: Ichetucknee is one of Florida's top tubing locations! Tubing and kayaking equipment is available for rent through vendors located outside the park. Scuba diving is also available through the months of October to March in the gorgeous Blue Hole for certified scuba instructors only. Due to its popularity as a tubing destination, Ichetucknee Springs can be very busy on weekends and holidays; however, the crowds and long lines can be avoided by arriving early at the park. Enjoy the park with friends, family and even your pets! From 8AM to 6PM the park is available to all who want to come and enjoy the fresh north Florida air. Swim attire is not required for park entry, but is suggested to go for a splash in the water. The centrally located Ichetucknee connects to several springs on the Santa Fe River, including Ginnie, Lilly and Poe, and is conveniently near to the town of High Springs, which boasts a number of great restaurants and boutiques. 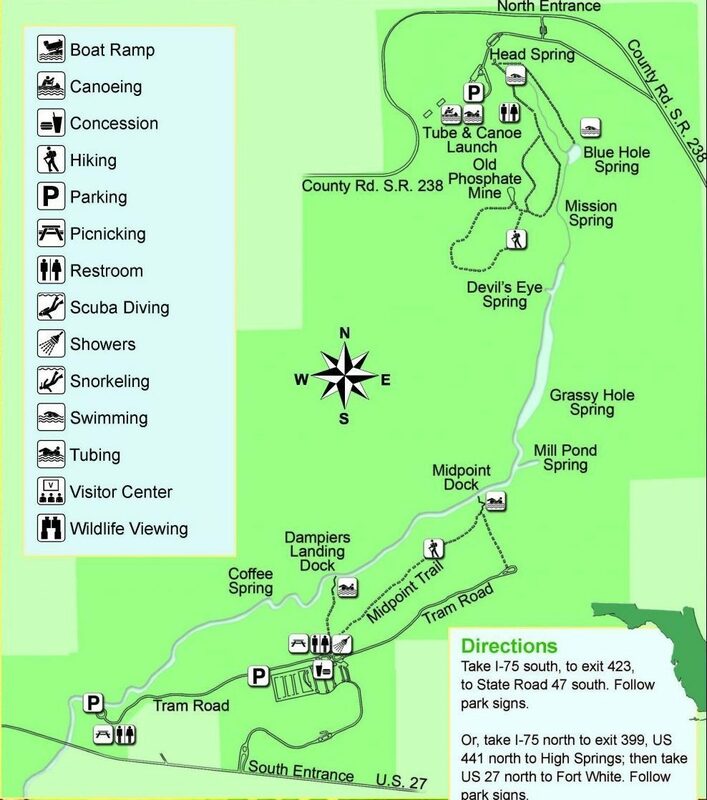 The following map and trail guide is provided courtesy of the Florida Department of Environmental Protection, Florida State Parks. ACTIVITIES: Hiking, biking, canoeing, kayaking, fishing, tubing*, swimming, scuba diving (October through March scuba diving is available in the Blue Hole only, for cave certified divers).